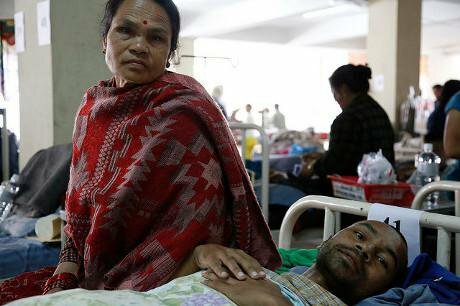 Hospitals—and this one in Katmandu was itself damaged by the earthquake—have been indundated with victims. Flickr / DFID. Some rights reserved. The earthquake in Nepal has potently demonstrated the security risks associated with natural disasters, of which security scholars, such as Paul Rogers, have long warned. The argument has been that countries in the global south, where the majority of the world’s population lives, would not be able to manage natural disasters, which would be increasingly induced by climate change. This, in turn, would lead to widespread violence. Hemmed in between two 21st-century superpowers—China and India—Nepal, home to nearly 26.5m people, is one of the poorest countries. For centuries, the values of interdependence and peaceful co-existence, partly necessitated by the tough mountainous terrain, anchored Nepalese society and maintained social harmony. This changed 20 years ago when a group of young rural Nepalese men and women, who called themselves Maoists, initiated a protracted insurrection. Even though a peace agreement was signed in 2006, the desperation which encouraged young people to take up arms lingers on. Unsustainable modernisation, aided by developed countries, has destroyed the traditional, environmentally-friendly living culture of Nepal—resulting in widespread deprivation of essentials such as clean water and air and good food. The Nepalese government has been unable to solve the country’s pressing problems or even offer much hope that solutions will soon be found. Instead, overwhelmed by the challenges generated by rapidly accelerating globalisation, the government has become largely dysfunctional—incapable of ensuring the physical security of citizens, let alone their economic and social security. The earthquake of 25 April came against the backdrop of, and hugely compounded, this pervasive sense of helplessness, especially among the young, further challenging Nepal’s fragile security. Hitting 7.8 on the Richter scale and with its epicentre in the hilly district west of the capital, Katmandu, it has been followed by a series of aftershocks, avalanches and landslides. Buildings have been destroyed, transport and communications disrupted and thousands killed. At first the government responded quickly, initiating its rescue-and-relief operation in Katmandu. But it did not take long for serious logistical limitations to be exposed. The rescue operation was severely hampered by Nepal’s difficult terrain but its underdeveloped communications infrastructure and outdated government bureaucracy were also obstacles. In remote districts people died before they could be reached and food and clean water have been in short supply. The Nepalese government has been unable to solve the country’s pressing problems or even offer much hope that solutions will soon be found. Support from the international community was swift and generous but inadequate to meet the overwhelming need. A week after the earthquake, the government has received only $4m for disaster management from foreign donors and even if additional funds promised by the international community are forthcoming they will not come close to meeting the economic cost of the disaster, estimated at around $10 billion. Because the government lacked capacity to distribute international aid, much of it did not reach areas where it was most needed. It has been estimated that over 7,500 people have already died as a result of this disaster. The United Nations estimates that a further 8m have been affected directly, including 2.8m displaced from their homes. Hospitals across Nepal have been inundated and there are not enough doctors or sufficient medicines to treat the victims. The acute shortage of drinking water and limited food supply bring fears of epidemic or famine, or both. The devastation has made the people of Nepal feel even more insecure, more alienated and more angry. Already there have been street protests against the government and sporadic skirmishes with the security forces. The day after the earthquake, a group of mainly young men demonstrated outside the parliament building in Katmandu, protesting against the ineffective response to the disaster. The prime minister, Sushil Koirala, was heckled when he visited hospitals to meet victims. People in remote districts have also been vocal. In a hilly village in Dolakha the windows of an administrative building were smashed and there have been reports of angry villagers blocking aid convoys and, in desperation, looting them. In the long-term, this resentment and frustration, as in the early 1990s, is most likely to result in violence. The current environmental disaster will probably also accelerate emigration, which will have adverse implications for global security. Already many have fled to India and it is expected they will be followed, over the coming weeks and months, by more seeking sanctuary and security in developed countries. The earthquake, and its aftermath, provides a timely window on to the challenge pose for international security by natural disasters, which will become more common due to environmental degradation. There is a real risk that the miserable situation in Nepal could be replicated in other countries in the global south if the potential impact of climate change on security continues to be ignored. As an eyewitness of the recent horror, I can only hope global leaders wake up to the need to build a truly sustainable global economy—before it is too late.